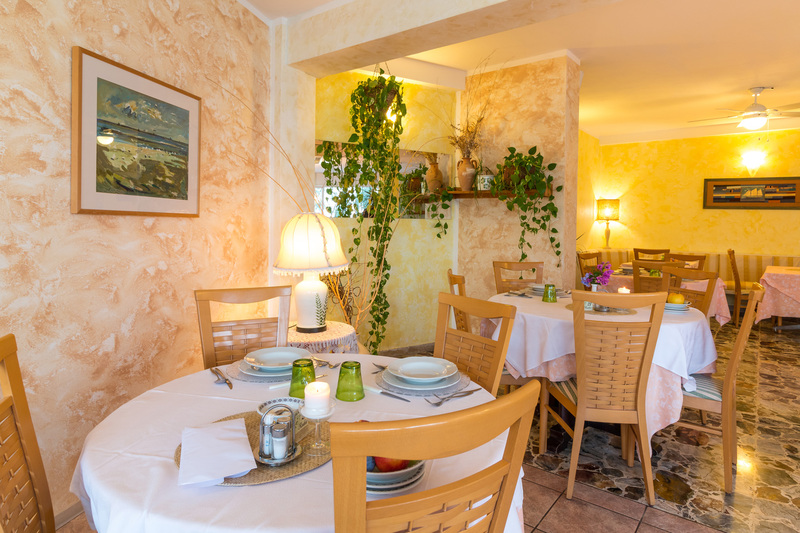 Our Mediterranean cuisine is based on fresh products selected day by day. 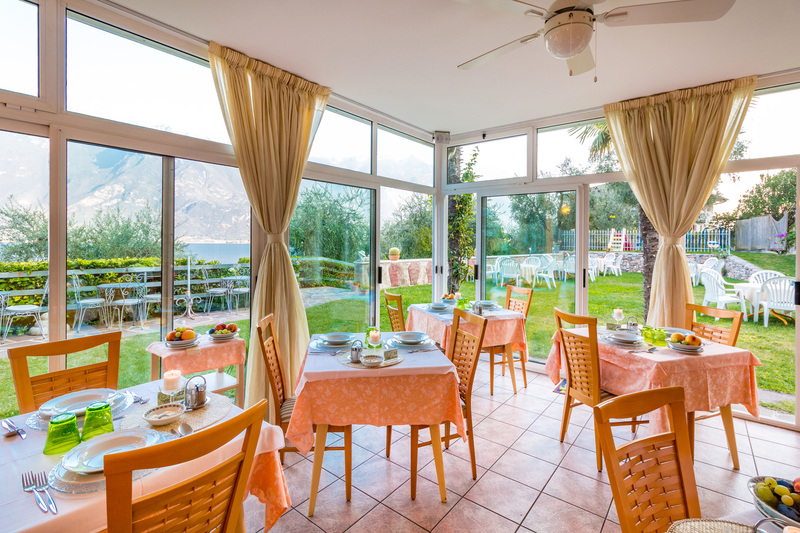 Join a relaxing lunch on the terrace, a small bite, with pasta of the day, omelette, salad buffet, melon with Parma hum, bruschetta or a Caprese, freshly made daily soup, and several Pizza types. Some people ask why dinner is at this time, rather unusual for Italians. Well, our clients relax around the pool all day, some have a large breakfast, stroll in the garden and at a certain point are hungry. But especially the bikers seem to enjoy an early rich dinner and after a whole day’s sport they are looking forward to Livio’s pasta. Finally, the early dinner allows you to have an evening walk to town and see some concerts, look at the shops that might still be open. Sit in the garden or on your balcony with a glass of wine and enjoy the moon reflecting its rays on the lake. The rich salad and vegetable buffet depends on what the garden provides each season: we always have rocket, lamb’s lettuce, red and green chicory, cucumbers, tomatoes, fennel, carrots, red turnips, sweet corn, olives and much more. We create our own dressing or one can use the olive oil of our own production, balsamic vinegar and so on. The buffet also has some finger food appetisers. ANTIPASTI, Every evening the buffet explores different sorts of appetisers taken from the Mediterranean tradition which consists of little bruschettas with tomato, garlic and celery or bruschetta with smoked trout, vegetables frittata, pizza of different sorts, fried fish, cuttlefish with olive oil and lemon, crouton with ‘pate de foie’ and herbs. Every evening the buffet explores different sorts of appetisers taken from the Mediterranean tradition which consists of little bruschettas with tomato, garlic and celery or bruschetta with smoked trout, vegetables frittata, pizza of different sorts, fried fish, cuttlefish with olive oil and lemon, crouton with ‘pate de foie’ and herbs. 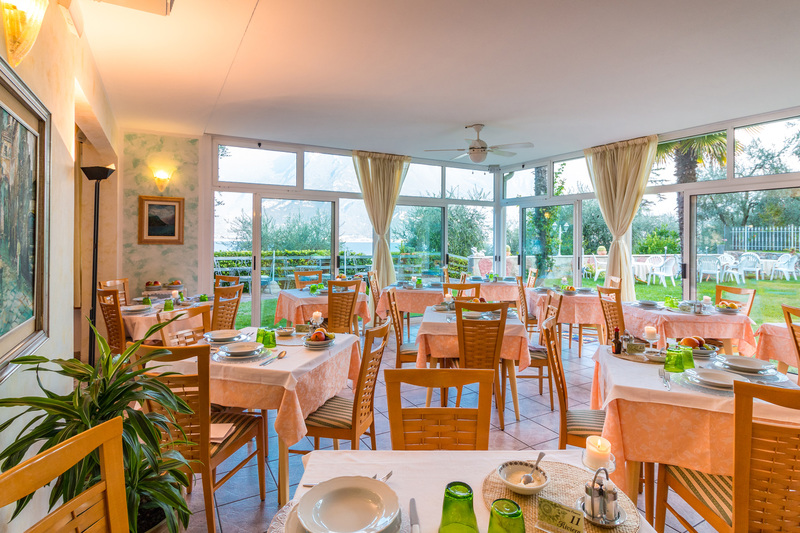 Every night there are two different kinds of first courses, a pasta dish or risotto, or several soups. PASTA: Most popular is the Saturday lasagne which differs from the usual kind of lasagne as Livio’s style is based on more sauce, alternating layers with white sauce and mince meat (‘ragù’, known as ‘bolognese’). Several types of pasta made with home made Basilicum Pesto and rocket, Sicilian Pesto, Pasta ‘alla norma’ which is made of home-grown aubergine, pasta ‘alla matriciana’ with onions and bacon, pasta ‘alla mantovana’ with double cream, mushrooms and fresh sausage, pasta with gorgonzola cheese mixed with tomatoes, Mediterranean style with olives, tuna, peanuts and capers and many other types. RISOTTO: is a special round rice grown in northern Italy which is served as a first course with different flavours, with red chicory from Treviso, or with pumpkins, or with mushrooms, and best of all with porcini mushrooms. SOUPS: Many soups at the Rodella’s have a long tradition. Grandmother’s soup is with chicken liver, or mixed vegetable soups, pumpkin soup, carrot soup with rosmary, tomato soup of the house, mushroom soup, zuppa Toscana and so on. MOST OF OUR FIRST COURSES ARE SUITABLE FOR VEGETARIANS- SECOND COURSES ARE RICH WITH COOKED VEGETABLES ALSO. HOWEVER TELL U IS YOU ARE VEGETARIAN AND THAT YOU WANT TO AVOID MEAT. 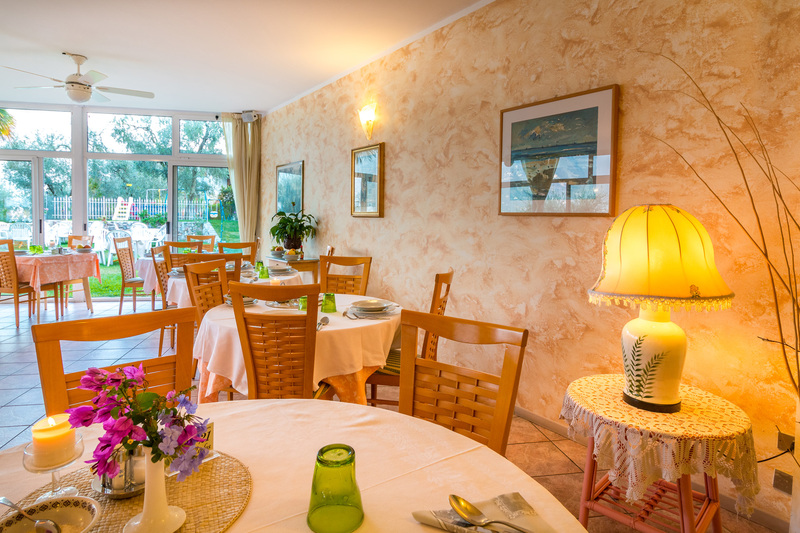 Various meat dishes are offered every day, always accompanied by cooked vegetables and different sorts of potatoes. The roasted meat is Livio’s speciality, roast beef thinly cut and cooked slowly all night and served with rocket, parmesan and olive oil, or roasted in a pan such as ‘Manzo all’olio’, beef with olive oil, thick cut, well cooked but very tender and served with a thick sauce. Well known is the roasted chicken breast with mushroom sauce, stewed beef with spaetzli , ‘a kind of egg gnocchi” served usually as a second dish. Livio gives his spaetzli a personal touch by cooking them with pumpkin and serving them with a lot of parmesan cheese. Always different is the choice of potato; special is roasted potato with rosemary, or boiled potato served with parsley, olive oil and balsamic vinegar. Every night there is a different style of cooked vegetable : grilled peperoni, zucchini and stuffed tomatos, and so on. Every Friday there is the possibility to have trout baked with bread and peanuts or with almonds with the option for those who do not like fish to have grilled meat and steaks. the afternoon tea or cappuccino at the bar Riviera. There are several desserts prepared for dinner. Every night there is a different choice of freshly homemade sweets, with chocolate, cheese cakes, cream and yogurt dessert with strawberries, tiramisu, crème brulee with vanilla, chocolate tart, lemon and cream tart, freshly made half frozen ice cream served on a special fruit salad in passion fruit juice. Desserts are not only good but an attempt to capture the eyes and the heart. We cook mainly with “Extra-Virgin” olive oil that we produce from our own trees. Limone’s extra virgin olive oil has always been considered to be a precious ingredient of “haute cuisine”. 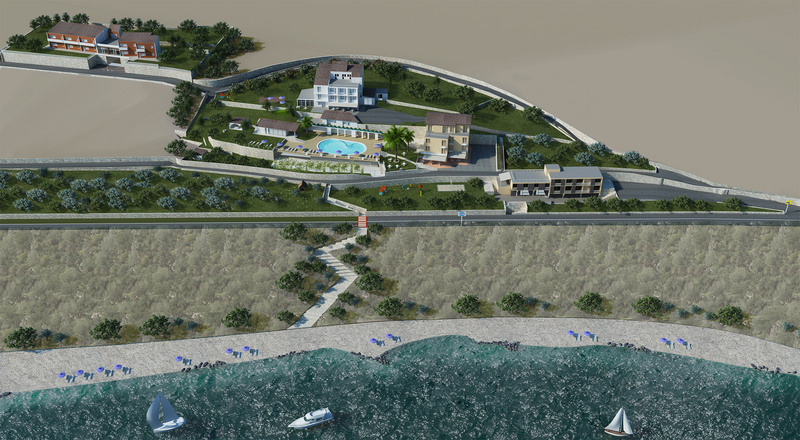 Our hotels Riviera, Serena, Mignon, Rodos are surrounded by 8,000 sq.m. of terrain on different levels and well positioned for the maximum benefit of the sun. We cultivate a total of 250 trees, including the Leccino, Casaliva and Frontoio varieties. The oil is renowned for its high value of polyunsaturated fats and considered to be of the best quality and of certified and protected origin. Our olives are hand picked by Livio, Mario, Carlo and Marco Rodella. Limone’s mill is still very traditional and the olives are cold pressed. The oil is marked by an intense and fruity flavour valued for its recognised genuine and antioxidant qualities, particularly if used cold on vegetables. It enhances the flavour of fish and other foods such as meat and pasta sauces.